MSD’s cam sync plugs are the perfect solution when running an aftermarket sequential EFI system with coil-per-cylinder ignition. 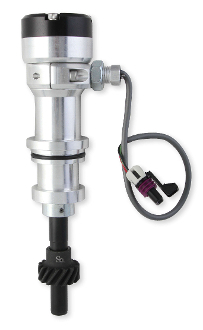 The cam sync plug installs in place of a traditional distributor, providing a hall-effect cam sync signal needed for the EFI system to reference the # 1 cylinder. For wet sump applications, the plug also drives the oil pump. MSD’s cam syncs are plug and play with Holley EFI systems and can easily interface with most aftermarket EFI systems.